"We've been here the whole time. You've been asleep. Time to wake up"
YAAASS I HAVE BEEN SLEEPING. no, but seriously, I have been sleeping on Twenty-One Pilots while they were on break. I had no idea what their secrets clues meant. I have no idea who Clancy is. I have no idea who Dema is. I have no idea what Nico and The Niners are. I am clearly an old 25 year old FAKE fan. I want to know what all those things are and I will do my research when I have time. But there is so much information to process that I haven't had the time. In the meantime, I wanted to post my reactions to the song. JUMPSUIT: I love the drumming in the beginning of the song. When the song first started, I was like, "yes!! They have delivered." I like the emotions this song evokes....the feeling of trying to get away from something that is scaring you. There are moments when you feel calm and moments you feel like screaming which this song executes perfectly. There's a moment when it gets quiet, and then the build up to Tyler's scream. LOVED IT. The jumpsuit is supposed to represent protection. 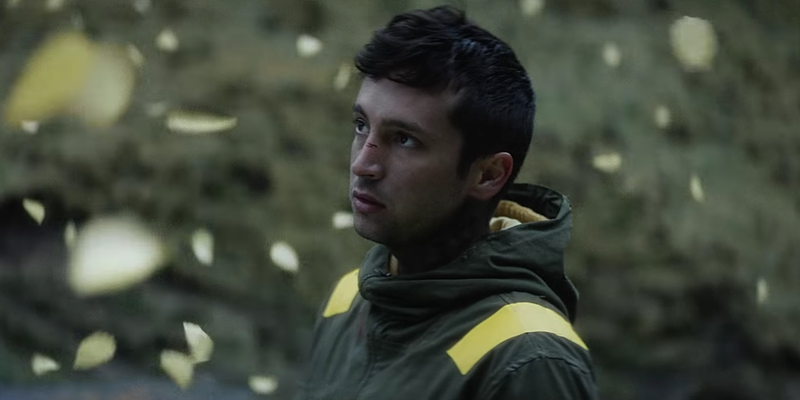 The few clues I have read about this new era is that the color yellow is supposed to protect either Tyler or Clancy? I thought that was really cool because I remember when the Heathens music video released, I was like WOAH YELLOW BLAZER. That really stood out to me. I used to joke that Tyler is definitely going to write songs about how intense it is to get so much fame and success from their last album, Blurryface. And lookie here, I was right!! Tyler's first few words for this new era were, "I can't believe how much I hate/Pressures of a new place roll my way." They are so predictable (in a good way, of course!). Nico and The Niners: As I've said, no idea who this nico is or these niners are! I do like the song...in the beginning, I liked it more than Jumpsuit. It's familiar. Now that I've listen to it quite a few times, I feel like it's very similar to their previous songs...which makes it a little less original. I can hear similar reggae beats from some of their older songs. This song reminds me of Message Man for some reason. I feel like the rapping is similar here too. "Save your razor blades - not yet." I feel like this line should have a trigger warning. It is jarring. I don't think I'm going to listen to the song as much because of it. Nico and The Niners has a lot of call backs. It has call back to East which I believe was a clue. It has a call back to Dema, what ever that is. It even calls back to Jumpsuit! I wish this song was easier to understand if you didn't follow the clues. I actually wish that of both songs - that it was more catchier, that it had a better chorus that actually says something meaningful. Anyway, those are just my initial thoughts. Let me know if you agree or disagree with me in the comments! !